When Vintage Technologies was first formed, we set out to do things differently from our competitors and this is still the case today. One of the first ideas we had was to offer an ad-hoc IT support service to smaller businesses who couldn't justify the money they needed to spend on a full IT support contract. Support "on tap", as and when required, proved to be an instant hit and we have always taken it as a great compliment when another IT company finally decides to introduce a similar service. Who Is Ad-Hoc IT Support Right For? Support contracts aren't right for all businesses and the ad-hoc IT support service that Vintage Technologies started is most suited to the smaller end of the market.One-man-bands and businesses with up to 5 PCs configured in a workgroup will probably find they save money by buying support as and when they require it, whereas a business with a server and / or more workstations will mostly decide that it's in their interest to implement Preventive support and to have the peace of mind of an IT support contract with guaranteed levels of service. Ad-hoc IT support service provided by Vintage Technologies is completed on a 'best endeavours' basis so even if you've never spoken to us before, we can send a consultant to deal with your IT problems straight away. Of course, if you already have the facility for us to gain remote access to your computer network, we can use this method to deal with your problems as quickly as possible. Vintage Technologies provides labour at an agreed minimum rate of 2 working hours at $100 per hour. Subsequent hours, where required, will be charged at our standard hourly rate (rates are quoted upon request). Once a client has agreed that any service provided by Vintage Technologies are completed, the job will be deemed finished and any further briefing will be considered as a new contract, which will be governed by the same terms and conditions. In this way, there is no further obligation by the customer or by Vintage Technologies which makes it the perfect way for smaller businesses to enjoy expert IT support but without having to invest in the commitment required by a contract, leaving them in absolute control of their budget. If you'd like a quote for an IT Support Contract or simply want to find out more about our IT support services and how we can help you and your business, why not contact Vintage Technologies today? 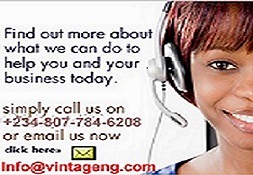 Call us on +234 909 444 6208, use our contact form or email us now at info@vintagetechnologiesltd.com.